Richard Pérez-Feria is Senior Vice President, Editorial & Entertainment at República, a Miami-based advertising, branding, interactive and communications agency, where he focuses on the firm’s myriad Web and media projects, entertainment, sports and celebrity clients, licensing and ancillary business opportunities and special events. Pérez-Feria was formerly the Editor-in-Chief of Time Inc’s People en Español, a position he held from early 2003. He brought two decades of publishing experience to the nation’s best-selling Spanish language magazine. In his first year, Pérez-Feria oversaw a revolutionary redesign of the New York City-based magazine and, in the process, redefined its three primary areas of focus: exclusive celebrity stories, fashion and beauty features and compelling human-interest coverage. Currently penning his memoirs—to be published by HarperCollins—titled It’s Exhausting Being Fabulous…And Other Things I Told My Mother, Pérez-Feria, upon leaving People en Español, launched RPF Ventures, Inc, a Los Angeles-based entertainment company focusing on film, television and media projects where he served as President. He was also the Executive Producer of the award winning and film festival favorite movie, East Side Story. Before starting at República, Pérez-Feria was the founding Editorial Director at BRASH.com, the large and much-lauded men’s Web portal owned by Glam Media (glam.com). At BRASH, Pérez-Feria was solely in charge of the site’s creative output as well as its content and penned the vast majority of its articles. Prior to heading People en Español, Pérez-Feria was Editor-in Chief of 7x7, San Francisco’s premier fashion and celebrity magazine. Concurrently, he served as an editorial consultant to the San Francisco Chronicle’s Sunday magazine, working directly with the paper’s editor Phil Bronstein. In 2000, Pérez-Feria joined Weider Publications’ New York City office as Vice President, Editorial and Creative Services, overseeing all editorial and creative aspects of the health and fitness publishing company’s specialty division. During his tenure, he launched numerous titles, including special newsstand issues of the company’s core magazines. He also served as Editor-in-Chief of SHAPE’s Fit Hollywood, JUMP, Fit Pregnancy Style and Strong. From 1995 to 2000, he was Executive Vice President and Editorial Director of PressCorps, Inc in New York City. As co-founder and co-owner, he led numerous trade and consumer titles and many magazine launches serving as Editor-in-Chief of a variety of publications including Celebrity Style, music choice Magazine, Teen Celebrity, City Family/La Familia de la Ciudad, American Druggist, Issues In Patient Care, Medical Tribune, gym, Burn! and TennisMatch. From 1990 to 1993, Pérez-Feria was Editor-in-Chief of Miami Mensual/Monthly, then the nation’s largest monthly bilingual consumer magazine for Hispanics. 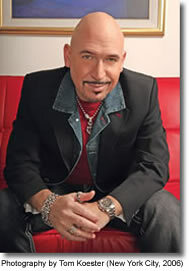 In 1992-93—along with his responsibilities at the popular monthly—Pérez-Feria was co-host (with Tara Solomon) of a nightly, three-hour radio program on WMBM called Beach Party With Tara and Richard where he interviewed numerous celebrities and colorful personalities populating the emerging South Beach (FL) scene. In 1989, Pérez-Feria was the founding Editor-in-Chief of the Miami-based financial weekly, International Business Chronicle. Pérez-Feria initially gained widespread recognition as the founding Editor-in-Chief of POZ, the first national consumer magazine for the HIV-impacted individual, where he led the publication from 1993 to 1995. Pérez-Feria and POZ received numerous honors, including a nomination for a National Magazine Award for General Excellence. Pérez-Feria began his journalism career at the venerable Esquire and was on the launch team of the groundbreaking and award-winning New York City weekly, 7 Days. On a personal note, Pérez-Feria was the recent recipient of Ballet Hispanico’s prestigious Inspiration Award, honoring those who have empowered the Hispanic community through the quality of their vision. The award was presented during a glittering gala in New York City. In 2006, Pérez-Feria was also unanimously selected by the Board of Directors of GLAAD to receive its first-ever Visibilidad Award, presented by Gloria and Emilio Estefan at the sold out GLAAD Media Awards, given to a high-profile Hispanic media professional who best represents the goals and ideals of the charitable organization. On February 2, 2003, the City of San Francisco established Richard Pérez-Feria Day and bestowed Pérez-Feria the city’s highest honor in a well-attended ceremony. Pérez-Feria was also Honorary Chairman of the 2007 and 2008 GLAAD Media Awards in Los Angeles as well as serving on the Host Committee for the 2006-08 Outfest Honors in Hollywood. A graduate of Tulane University, Pérez-Feria currently resides in Miami Beach.